How to Add eBooks to iBooks for Viewing PDF on iPad? For people who have iPad, they should be familar with the Apple iPad embed eBook reader - iBooks. iBooks is an amazing way to download and read books. As the biggest competitor for the kindle, iPad ibooks includes the iBookstore, where you can download the latest bestselling books or your favorite classics and read the eBooks on iBook with perfect experience. However, if you'd like to read your own eBook on ibooks, you have to find way to add books to iBooks to view PDF on iPad. Things are the same with reading PDF on iPad. If you have many PDF ebooks and want to view these PDF files on iPad iBooks with good reading experience, you should convert PDF to EPUB format which iBooks supports and sync them to iBooks. Read PDF on iBooks is not as difficult as you imagine, PDFMate introduces you the solution to read PDF eBooks on iBooks by the following 8 steps. Tools needed: Calibre; itunes; iBooks. Step 1. 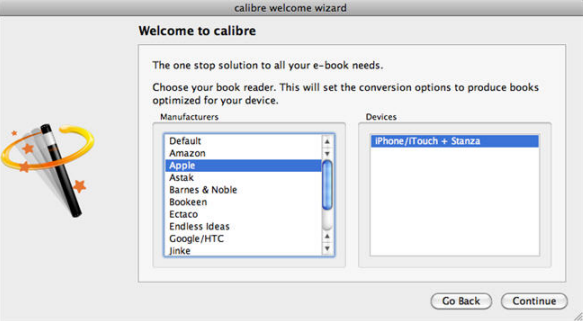 Download and install calibre (calibre is a free and open source e-book library management application.). Step 2. Find the PDF file you want to convert. Here we take 'The Adventures of Tom Sawyer' for example. Step 3. Specify your 'ebooks' folder (the location you'll save your converted EPUB files. ), then click continue. Select Apple from the Manufacturers list, and iPhone/iTouch + Stanza from the Devices list. Step 4. Click 'continue', it would lead you to the main interface of calibre. Click "Add books" button in the top-left corner of the window to import your PDF file into calibre. Step5. 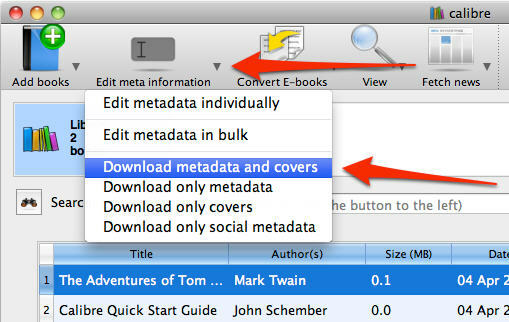 Now click the small 'arrow' next to the Edit Meta information and select Download metadata and cover files. 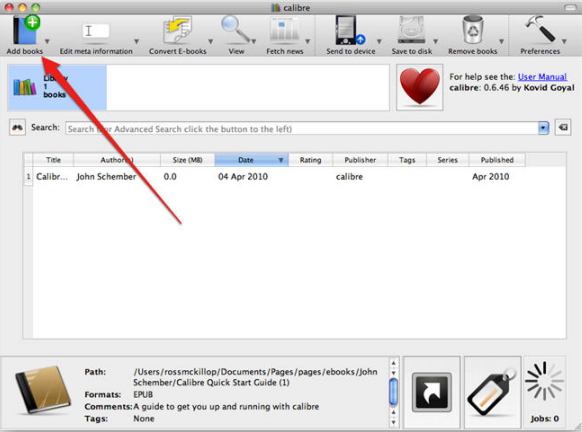 Calibre will now download extra information about your PDF/ebook. If it's a PDF eBook, you may need to manually enter the ebook title and author name if it isn't present when you load it into calibre initially. Step6. After download the ebook meta information. Click the small arrow next to the Convert E-books button. From the drop-down list, select Convert individually. You will be prompted with a "summary" window prior to calibre making the final conversion. Just click the OK button. Step7. When the conversion is finished, you can locate the folder on step3 where you save the EPUB file. Then connect your iPad to your Mac or PC, and launch iTunes. From the iTunes menu select File -> Add to Library… to import the converted EPUB file. 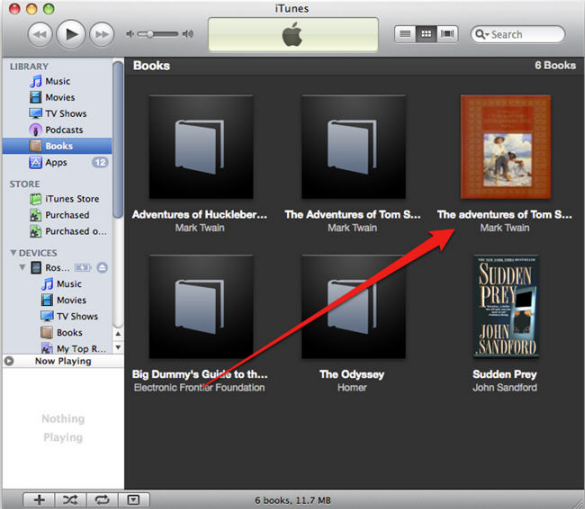 The converted EPUB file will now appear in the Books section of iTunes. Step8. Select your iPad in iTunes and select the Books tab. Make sure that the converted EPUB eBook is on the list, then click the Sync button. It is time for you to lunch iBooks on iPad and find the eBooks on iBooks.